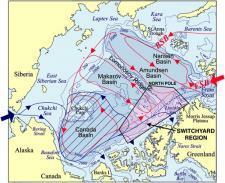 The proposed research will document the circulation, variability, and driving mechanisms of the upper ocean in the “freshwater switchyard of the Arctic Ocean.” This unexplored region lies to the north of the eastern Canadian Archipelago and Greenland, extending about 500-800 km into the central Arctic Ocean. It lies just upstream of the freshwater exit points in Fram and Nares Straits, i.e., where freshwater from various sources is finally delivered to some of the main channels that lead to the North Atlantic Ocean. Evidence suggests that the circulation in this region is highly variable on interannual time scales, and that this variability might correlate with large-scale climate signals such as the Arctic Oscillation. However, the mean circulation, interannual variability, and physical processes that govern the circulation of this area are presently unknown. Our main hypothesis is that this area is a bifurcation point for freshwater transfer between the Arctic and North Atlantic Oceans, and that small changes in the overall circulation of this region may have large downstream effects.